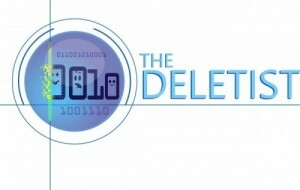 The Deletist – Page 50 – Be elite and delete. Save strategically! It seems pretty common to create an account for just about everything on the internet, mostly so that user habits can be monitored, tracked and analyzed. Or so that a history of activities is recorded and made available at a future time. Many of these accounts I create for a one-time use and then forget about them. Phase II of my Account Cleanup Project will require me to identify what the accounts are for and assess whether I actually need them or not. If they are not needed I want to delete them. This coincides nicely with the release of a new website called justdelete.me. justdelete.me lists popular sites and ranks how difficult it is for a user to delete an account, keeping in mind the difference between an account deactivation and a deletion. justdelete.meeven has a chrome plugin that will rate a site with a colored dot that signifies how easy or difficult it is to delete an account. Rating system used with Chrome to determine how easy it is to delete an account. Naturally I love anything that has to do with deleting stuff. I appreciate what justdelete.me is trying to accomplish, but I’m curious about how deletions are handled from the service providers end. Is it just the account connection that’s being deleted or does all my information go along with it? How many accounts do you have? How do you remember logins/passwords? Will you be trying to delete any of your accounts? um…er…an uncomfortable pause followed while my brain worked feverishly to find a tactful way to explain my “under-50 rule” without sounding like a nut. When deleting phone or email contacts it’s easy to explain that your new phone didn’t transfer everything properly. Or your email got hacked and it affected the contacts list. FB is synchronous, meaning if you friend somebody they friend you back automatically, so lost devices or hacking don’t really work as explanations. Considering my options, I went with partial honesty. I explained that if I don’t hear from somebody in a year I remove him/her as a friend. He didn’t appear to take it personally and honestly I don’t see why he would care. The only communication we ever had on FB was the initial friend request. What kind of a “friend” is that? I know that some of my readers are squeamish about deleting FB “friends” because they’re afraid of hurting the other person’s feelings. Consequently, many of them don’t enjoy using FB, or they’ve stopped using it, because they’re not connecting with quality people. Someone told me that he accepted his boss’s friend request and then didn’t enjoy using FB because he felt uncomfortable. What’s the point of that? Your FB account is for you and you should cultivate FB friends the same way as in-person friends: if they don’t bring you value, get rid of them. Unfriending is easy, way easier than in real life. I find most “unfriended” people either don’t notice, or don’t care, because there probably wasn’t much of a connection to begin with, unless they have the Unfriend Finder. Admittedly, the run-in was a tad awkward, but we got over it and had a pleasant conversation which was more contact than we ever had during our year of FB “friendship”. Today’s challenge: Unfriend one FB “friend” that prevents you from enjoying your account. According to Merriam Webster’s dictionary, the word default comes from de, meaning “of” or “from”, and the French verb faillir meaning “to fail”. The top definitions for default, as both a noun and a verb, all have to do with failing to do something. The other definition refers to a selection made automatically, often in reference to a computer program. I suppose that default settings are supposed to make life easier by assuming what the majority will prefer. For example, Google recently released a new version of Gmail that automatically separates your email into 5 categories: Primary, Social (meaning notifications from social media sites), Promotions, Updates, and Forums. New default categories from Google to presort your email. I’m not sure if this is useful to people or not, but the point is Google gave it to me assuming that was what I wanted. Now I have to make an effort to turn the feature off. While I may end up liking the new system, I would have preferred to turn it on myself, or define my own categories for presorting my inbox. This is not to say that there is no validity to the defaults, just that they’re not the ones that I prefer. I’ve often noticed that Facebook updates often require me to adjust the privacy and security settings to ensure that I still have some! are almost always selected automatically. This means I need to make an additional keystroke to deselect the option. Why can’t the option be offered without being automatically selected? I’m certainly capable of deciding these two options for myself. Some defaults can be changed through system settings, but others appear each time I login, regardless of settings. I’m not qualifying default settings, I just don’t want the ones compromising my privacy and security preselected. How do you feel about default settings? Do you like to stay logged in and have your browser remember passwords? You can now sign up to receive updates when a new post comes out. Ironically enough, it seems to me that social media has turned sharing into an insular activity. Never before can I know more about my friends, or share more with them, all by not having any direct contact. When I was growing up, I didn’t need to search on Facebook for “music my friends liked” because I was hanging out with them and we would listen to albums together. We shared the music, and the experience, by listening to it at the same time. We’re all connected, all the time through social media, emails, chat, phone, our devices, the internet, etc. But are we really sharing with each other in a meaningful way? 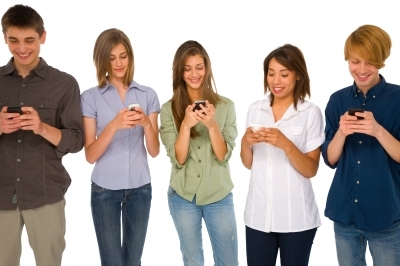 I often see people “socializing” by standing around in a group, each one on his/her own private device. Is talking becoming taboo because we more readily use other methods of communication? It reminds me of these dance parties I used to hear about in NYC called Mobile Clubbing. People would show up at a designated place and time to dance together, each one to the beat of his/her own tunes via personal headphones. Is this what “e-socializing” is all about, connecting without actually having contact? How do you share things with your loved ones? Everything else on my FB page is because somebody tagged me or made a comment. I often want to leave FB, but I participate in activities that only connect with participants through FB. Enter FB’s latest development, Graph Search, which offers users a way to search for common interests among friends and strangers. People are interconnected by their likes, friends, pages, and comments. Graph Search allows users to search for these interconnected bits of information through the use of an interface designed to combine elements. So what does this mean for FB users? 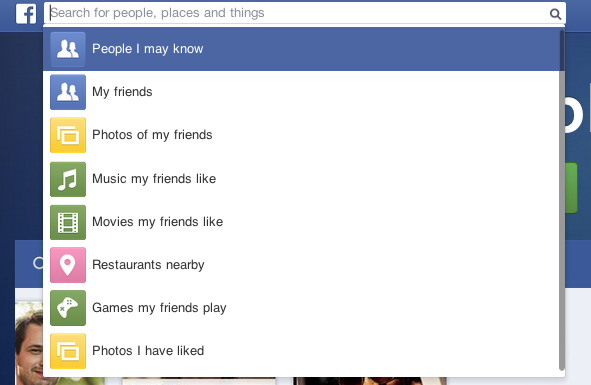 For an active FB user, perhaps this could be a useful way to discover new interests or likes. After all, we are often influenced by the opinion of our friends and peers. FB can be a “go-to” resource to find out all kinds of useful things like peer-approved restaurants and music albums. Huh? So I can hide things on my timeline, but then they’ll appear in every other place on FB? What’s the point? And is this the kind of stuff that will be harvested and used by Graph Search? As of this moment, there is no way to opt out of the Graph Search. Or at least I couldn’t find anything in the settings that disabled the Graph Search. If you find something, let me know. As a passive user, I don’t want my few “likes” being interconnected and search for in contexts that I can’t control. Of course the easy answer is Get Off Facebook, but then how do I stay connected with my few groups that are only on FB? Even before I joined Twitter, I was always fascinated by the hashtag. I’m not sure where my fascination originated but it sounds cool and I definitely like hearing about how it’s becoming part of mainstream culture. I’ve even heard celebrities use the term when talking to audiences, instructing their fans to use social media and hashtag [insert word here]. So what is this hashtag that everybody always talks about? Hashtags are keywords denoted by the pound symbol # and were started by Chris Messina in August 2007. You can see the original tweet here. Twitter can be a wild place and the hashtag was suggested as a way to group tweets related to a certain subject. The idea went viral in just a short time, but I know from speaking with other twitter users, that a lot of them don’t use the hashtags either because they don’t really understand them or realize how to utilize them effectively. Even I have not put any hashtags on my tweets, but that’s just because I’m still getting warmed up. Tags, however, are not a new concept for digital formats. A lot of sites have been utilizing them long before the hashtag existed on Twitter. They provide descriptive terms about items including blog posts, digital images, articles, stories, websites, etc. In other words, they are a type of metadata that can be used to describe content and offer users ways to search and interact with information. Using a keyword to describe content for search and retrieval is not new to people in my profession, and in fact, has been used by us for a long time in a surreptitious fashion so users would not feel like they were doing extra work. But I like to think that the hashtag has changed the perception of using metadata and made it something popular, effective and cool to use. Hashtags are often used on Twitter to mobilize people around a certain topic or event. In fact, many people host TweetChats, which are Twitter discussions happening at a scheduled time and get people to participate by adding a specific hashtag to their tweets. This allows people to follow the discussion, otherwise the tweets would get buried in the thousands of other messages being created. My one real complaint with hashtags, and tags in general, is that they can be so inconsistent. I love that tags can be a free form way for people to interact with their information, but on the other hand, it introduces a lot of errors like spelling mistakes, or too many variations to describe one thing. For example, think of how many ways New York City could be described in a tag: NYC, New York, Big Apple, New York City, NY City, NY, etc… How could you ever search for all of those? So when you use tags, hash or otherwise, be mindful.